Grade 4 - Duration 7:40 1. Allegro appassionato - sonata allegro - E minor 2. Adagio cantabile - theme and variations - F major 3. Allegretto giocoso - abridged sonata-rondo - E minor This piece is one of a series of 13 sonatinas for wind instruments and piano. These sonatinas all are in traditional style and, as the name would suggest, closely follow sonata form on a somewhat smaller scale. But that only refers to length, not difficulty level. They are not beginner material, all being in the grade 4 - 5 range of difficulty. 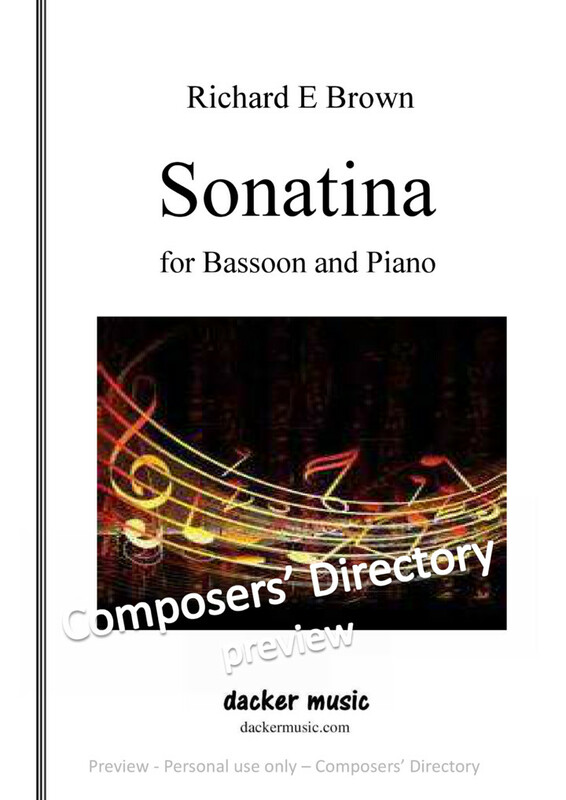 As title indicates, Sonatina Bassoon Piano closely follows sonata form asomewhat smaller scale. Tonality tonal relationships basic sonata form, andin this sonatina, tonal relationships within between movements basedon seconds. The first movement, Allegro appassionato, fairly strict sonata-allegro minor. 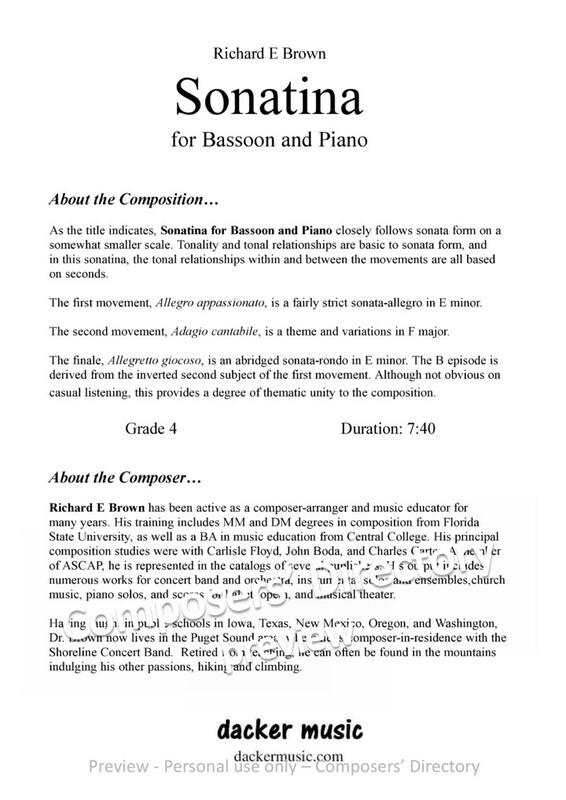 The second movement, Adagio cantabile, theme variations major. Richard Brown been active composer-arranger music educator formany years. training includes degrees composition from FloridaState University, well music education from Central College. principalcomposition studies were with Carlisle Floyd, John Boda, Charles Carter. memberof ASCAP, represented catalogs several publishers. output includesnumerous works concert band orchestra, instrumental solos ensembles,churchmusic, piano solos, scores ballet, opera, musical theater. Having taught public schools Iowa, Texas, Mexico, Oregon, Washington,Dr. Brown lives Puget Sound area, where composer-in-residence with theShoreline Concert Band. Retired from teaching, often found mountainsindulging other passions, hiking climbing.